Dr. Gustavo Oderich uses industry-sponsored clinical trials and new technology to repair aortic aneurysms, giving patients the chance they didn’t have. Arthur Poll was visiting family in Tucson, Ariz., when he felt a sharp pain in his left kidney one evening. The next day he saw a doctor, who scanned his abdomen. The 88-year-old had an aortic aneurysm, a balloon-like bulge in the largest artery in the body, which carries oxygenated blood to most of the body’s organs. The aorta normally measures 2 to 3 centimeters across. An aneurysm measuring 5 centimeters in women, 5.5 centimeters in men, is a candidate for surgery. Poll’s measured 12 centimeters —nearly 5 inches. Poll’s children drove him back to Minneapolis, where they sought a second opinion. Doctors there confirmed the pessimistic prognosis. But one doctor added that he knew Gustavo Oderich, M.D., a surgeon at Mayo, who was enrolling aortic aneurism patients in innovative industry-sponsored clinical trials. Poll’s family called. Dr. Oderich said he was interested in his case. They met the next day. According to the Centers for Disease Control and Prevention, aortic aneurysms are the primary cause of about 10,000 deaths a year in the United States. They are more common among men, smokers, and the elderly. The danger of an aneurysm is directly related to the diameter of the ballooned artery. The chance that an artery of 5.5 centimeters will burst ranges from about 5 to 10 percent per year, says Dr. Oderich. At 7 centimeters, the risk is 30 percent; at 8 centimeters, 50 percent. Two days after seeing him, Dr. Oderich threaded an artificial stent through an incision in Poll’s groin, up his femoral artery, and into his aorta. Once in position, the stent sprung open to form a leak-proof tube to carry blood through the damaged part of the aorta. The operation lasted about three and a half hours. Poll went home five days later. New stent designs make it possible to treat more aneurysms than ever before with endovascular surgery, rather than conventional open surgery. The benefits include lower surgical mortality rates, less blood loss during the operation, less chance of complications, and faster recovery. And in the case of Arthur Poll, new life for a patient other doctors had written off. His trim figure and boyish face belie Gustavo Oderich’s years in the surgical trenches. He trained in endovascular surgery in his native Brazil and then advanced his skills and techniques in internship, resident, and fellowship programs at Mayo, and then at the Cleveland Clinic. Since returning to Mayo and joining the staff in 2006, he has built a program of advanced endovascular surgical repair of aortic aneurysms. By working with industry and federal regulators to set up more than 20 clinical trials testing experimental aortic stents, he provides his patients access to some of the most promising technology available to repair a dire physical defect. 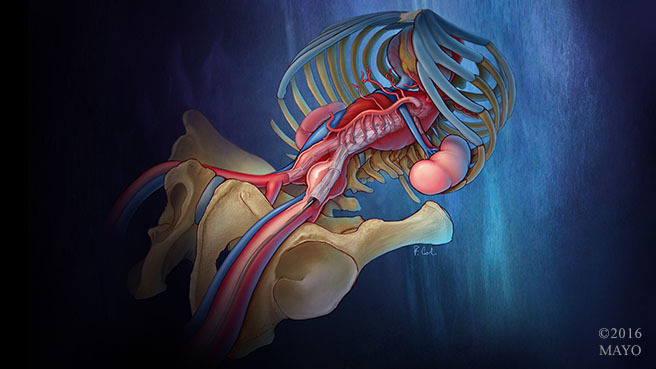 Illustration of the surgical planning of a patient treated with one of the first in-human implants of the Gore TAMBE stent-graft to treat a complex aortic aneurysm. Open surgery remains an effective technique. But it’s dangerous when the aneurysm is located high in the chest, near the heart. Mortality within 30 days of the operation is about 7 percent at Mayo and 19 percent in the United States at large. And mortality soars among older patients — 40 percent among those older than 80. Fortunately, there’s now another way to attack the problem. Poll is one of more than 300 patients — some at severe risk of death — who have received experimental endovascular (inside-the-vessel) stents for complex aneurysms at Mayo Clinic since 2007. These stent designs aren’t available commercially and can be used only because of the vast array clinical studies at Mayo. Some are being used in humans for the first time. Dr. Oderich is the principal investigator in many of these studies and the chief force in enrolling patients in “early feasibility” clinical trials that make many of these surgeries possible. When Dr. Oderich joined Mayo, the state of endovascular surgery was comparatively rudimentary. But in the years since, Dr. Oderich at Mayo — as well as some other surgeons at other high-volume centers — have used new technology to attempt complex procedures, anywhere along the aorta. Three-dimensional printed model of the aorta of a patient with complex aortic aneurysm. Model depicts the stent used to treat the aneurysm with side branches into the arteries of the liver, intestine and kidneys. The stents and how they’re made have also changed. At first, doctors custom-made their own stents. Dr. Oderich and others at Mayo still make stents in an emergency. But now companies such as W. L. Gore and Associates (makers of Gore-Tex) and Cook Medical make stents that range from plain wire-and-fabric tubes to complicated structures with fenestrations (openings) or branches to align with arteries branching to various organs. “The stent fits exactly to the anatomy of the patient,” says Dr. Oderich “But it’s not every patient that can wait eight to ten weeks to have a stent made for him. Then we look at off-the-shelf stents, stents that are one size fits all.” Stents made by a medical device company ensures greater efficiency and better quality control than those fabricated ad hoc. The problem — for patients — is that while medical device companies are continually developing new and potentially better stents, only a very few products have been approved by the federal Food and Drug Administration in the long process of commercialization. That means most surgeons don’t have access to them. But this is where Mayo’s clinical trials of “innovative medical products” (an FDA term) have opened up new options for aortic aneurysm patients. Dr. Oderich is the principal investigator for most of the trials, though several other vascular surgeons participate as well. “The FDA will allow us to have access to these devices, but it has to be in the setting of a clinical study, where we are evaluating the outcomes and reporting regularly to the FDA,” says Dr. Oderich. Since 2013, the FDA has encouraged greater innovations and a speedier route to commercialization of new products through its “early feasibility” clinical trials. “Some of them are really at the cutting edge of device development — devices that have not even been implanted in humans,” says Dr. Oderich. A case in point is Ronnie Hall, a retired truck driver from Blue Earth, Minn., who in December went in for a preoperative check-up for carpal tunnel surgery when his doctor pressed on his abdomen and decided to investigate further. A scan showed he had an aneurysm later measured at 9 centimeters across. Hall, then 79, went to Mayo Clinic. Dr. Oderich performed Hall’s surgery a week after was diagnosed, doing the first endovascular repair in the United States using a new design of stent manufactured by W. L. Gore. Three days after the surgery, Hall was discharged. A month later Dr. Oderich placed another stent inside the original one to open up a kink due to a “tortuous anatomy of the left renal artery.” The operation was performed under local anesthesia, and Hall went home the same day. Hall’s surgery illustrates some of the advantages of the newest developments in endovascular repair of aneurysms. Not only did Hall get access to one of the most advanced stents manufactured for the operation. He also spent minimal time in the hospital. Even the follow-up surgery was minimally invasive — a far cry from what would have been the case had open surgery been required. Based on what Dr. Oderich has learned, “A huge majority of the aneurysms can be treated by stents,” he says. Mortality from surgery has been far lower than what they would expect with open surgery — just over 2 percent of more than 300 patients. And not a single patient has died from elective surgery in the last five years. There are other considerations as well. “When we are treating these aneurysms, we don’t want major disabilities that change the person’s life, like becoming paralyzed or having a major stroke or being dialysis dependent.” All are risks of surgery. Moreover, the large incisions from open surgery often heal poorly and later produce hernias. “All these measures are pretty much universally reduced with stents,” says Dr. Oderich. The final measure of success is preventing death from a ruptured aneurysm. The endovascular stents have proven effective. According to Dr. Oderich, the incidence of a rupture is only about 1 percent every five years. What’s the secret to developing a clinical trial program that brings the latest devices and techniques to the operating room? “Nowadays it is practically impossible for an individual physician, or even an individual center, to put together the resources of engineers, all the bench testing that needs to be done, all the side factors that go into making a new stent or medical device without industry,” says Dr. Oderich. Much of that burden falls to industry because Medicare won’t pay for “early feasibility” trials. For example, W. L. Gore paid the costs associated with Hall’s surgery. Mayo Clinic’s system of interaction between disciplines also helps to build a strong program. Dr. Oderich says the endovascular aortic repair program is an example of what can be achieved at Mayo Clinic with collaboration of multiple specialties such as vascular surgery, radiology, anesthesiology, cardiology, nursing and other disciplines. Based on the number of ongoing clinical trials, the access of patients to new technology, and outcomes, “I personally think we have the best program in the world,” he says. Previous articleVascular Access for Hemodialysis – What do we really know?